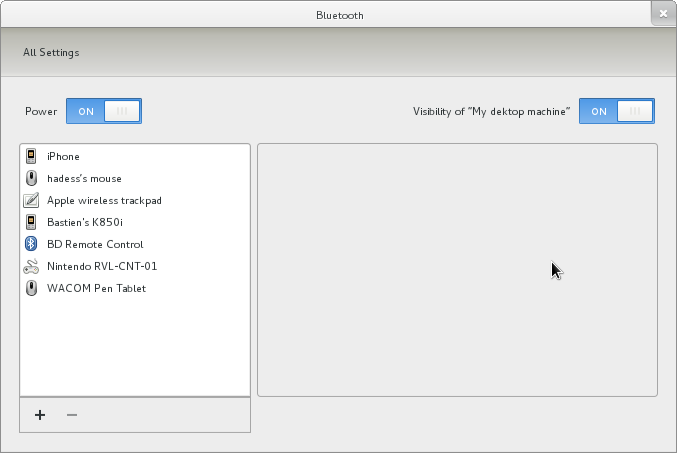 There was a tiny problem with the Bluetooth panel has it was implemented in GNOME 3. There wasn't a way to rename the Bluetooth adapter. Well, there was a way, but it wasn't implemented, but it was there, in our minds. 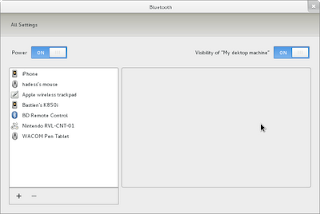 We started by adding support to the Info panel to set a machine's pretty hostname, as implemented by systemd. Looks simple enough. The next step was to make bluetoothd know about this file, and use it to name Bluetooth adapters, instead of crappy hostnames. And voila. Implemented as it should be. If you have applications where using a device's name (as opposed to the user's name) makes sense, please look into using the machine's pretty hostname. If you want to test all this, packages will soon be trickling into Fedora 16 (aka Rawhide). All the patches are upstream, though the bluez patches are still pending. Today was a shorter day, with many of the attendees taking their leave before the week-end (and a pizza lunch turning into kitchen discussions). Today focused on brainstorming around a Conversation app, to eventually replace Empathy. 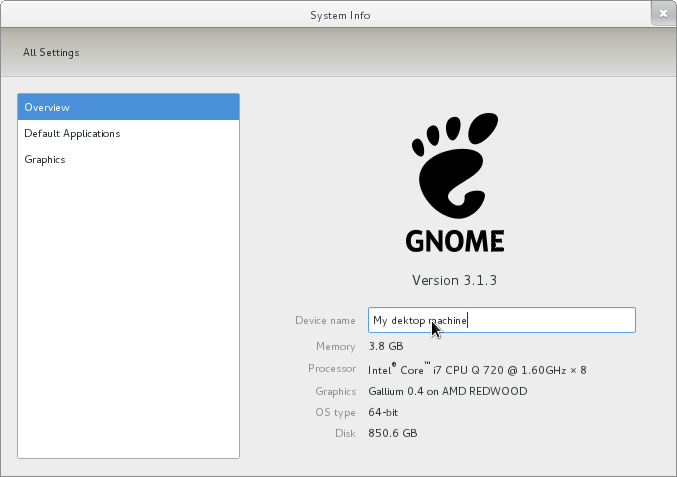 There are still many problems to be solved before that jump can be made though, so don't expect it to happen for GNOME 3.2. The other topic today was a reusable contact selector widget, to be used in applications that offer sharing to contacts, like Tiffany's on-going GSoC for document sharing in Evince. No cats were harmed during the making of this hackfest. Day three, and the walls are closing in. Some of our hosts mention they have “work to do” and hide away from light, behind shades. Alex Larsson showed up, bright and early in the Collabora offices, and most of the day has been spent working on a Folks hit list  with Travis and Philip as tech leads. Integration of GnuPG contacts metadata (can I encrypt e-mails for that person? ), as well as more general IM integration in apps (slide-show sharing for example) was also mentioned, as we hope to share most of this infrastructure. : Travis' knee was on the hit list, got whacked against a table leg. Day two, in the Collabora house, Rob Bradford graced us with his presence, on his birthday, and today started discussing integration of gnome-online-accounts into Empathy/Telepathy, libsocialweb and interactions with various accounts systems. Most of the rest of the pre-lunch hacking was about setting ourselves up for hacking on the above. The afternoon was spent with much of the same, trying to get more documentation for things like Google's Chat authentication, including a draft patch to gnome-online-accounts, Empathy/Mission Control work for this support, and tons of related bug fixes. The Telepathy hackers also discussed text handling in Telepathy (with the goal of making the specification clearer, avoid problems of "missed" messages, etc.). Many thanks to Intel, Red Hat, and the GNOME Foundation for sponsoring participants at the hackfest, and heaps of thanks to Collabora who are contributing a lot of participants to this hackfest, their offices, their coffee machine, and getting us pizza and Nutella dough balls yesterday. Num Num! In Cambridge (the proper one, in Cambridgeshire), at the Collabora offices, for the first day of our IM, Contacts and Social Hackfest. Tomorrow we'll have Rob Bradford joining us, and probably start talking about GNOME Online Accounts integration with libsocialweb, as a way to kickstart its use all across the desktop.